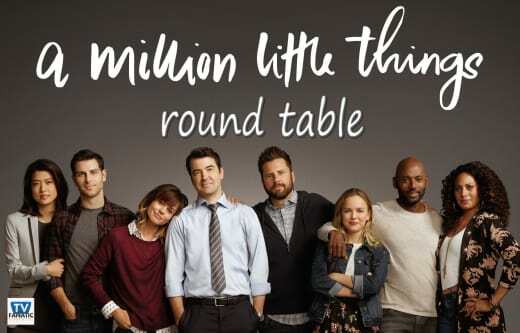 A Million Little Things Round Table: So. Many. Feels! Maggie is going to chemo! 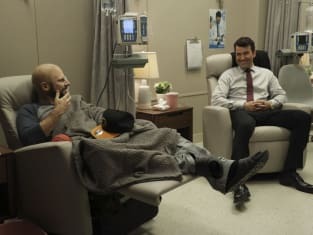 On A Million Little Things Season 1 Episode 9, after making peace with her past, the support and encouragement from her new friends, and Gary's honest and heartrending breakdown, Maggie decided to get chemotherapy. Rome was honest with his father about his diagnosis, Katherine and Eddie made some big decisions, and Delilah looked at her marriage to Jon with a new perspective. Join Rachelle Lewis, Jack Ori, and Christine Orlando as they discuss the hour and their hopes for the finale. Maggie is finally going to chemo. React! Rachelle: Yes! I was so happy to see her going to chemo. I had a feeling she was going to agree to get treatment. I think Gary’s breakdown at his cancer-free anniversary party is what finally convinced her to get treatment. Jack: I was thrilled! I agree with Rachelle. When Maggie saw Gary's breakdown, I knew she was reconsidering. When he said that this is what he gets for making plans, I had a feeling he was talking to her as much as to Jon. Now I just hope he answers her texts and they can get back on track. Christine: Maggie has had such a long journey to get here. She’s dealing with long-buried guilt and grief over her brother, and I do think that seeing Gary, who has always been so strong for everyone, break down was the final push she needed to decide to fight for her life. On a scale of 1-10, how emotional were Gary's flashbacks and his eventual breakdown? Rachelle: It was a 10. I thought it was a long time coming, especially with Maggie not agreeing to get treatment yet. I also think Gary is so angry with Jon for killing himself, but he never let that anger truly show until the breakdown. I was crying the whole time, and my heart broke for him. Jack: 10+. I also cried throughout his entire breakdown and found the flashbacks emotional as well. I caught Jon saying that Gary would outlive him. I don't think that was a clue he was going to commit suicide, but I did find it was a particularly moving thing for him to say, all things considered. Christine: It was a 10. Gary felt angry, hurt, and abandoned by his best friend. To Gary, what Jon did makes no sense. Why fight so hard for Gary to live and then turn around and kill yourself? Gary’s breakdown was a long time coming, and I was relieved he finally let it out. Do you think Rome's father will come to accept his son's depression or acknowledge his own? Rachelle: No to both. I think it was more about Rome being able to accept his own depression and being OK that his father didn't. He knows his father is not acknowledging his own depression, but also realizes they are very different. I thought it was great that Rome was able to understand he needs help regardless of whether or not his father agrees with him. It is tough to admit both. Jack: I'm not sure. Rome's dad seemed to see Rome taking anti-depressants as a sign of weakness, but at the same time when he asked if it helps, maybe the door opened a crack. I'm glad that Rome didn't let his dad's disapproval stop him from doing what he needs to for himself. I think that his feelings about his dad's disapproval will be a great thing for him to work through in therapy and his conversation with Gina was a good start. Christine: Anything is possible. People can change and perhaps seeing his son deal with these issues will eventually allow the father to accept his own depression and realize he can and should help himself. 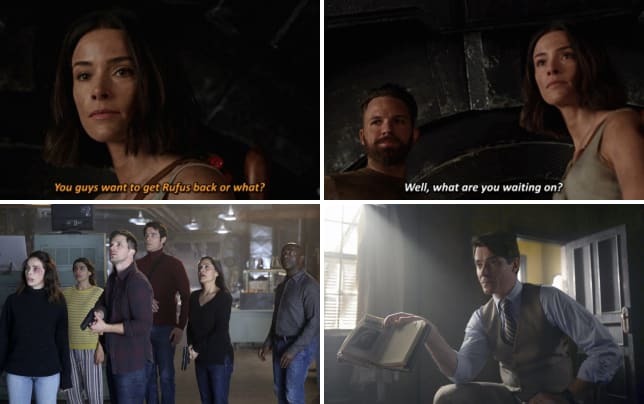 That said, there’s no guarantee that will happen, and I liked that Regina pointed out that what was important was that Rome respected and took care of himself no matter what anyone else thought. What did you think about Katherine and Eddie each taking steps toward change and happiness? Rachelle: I think it is about time. They were both just going through the motions of life but not truly being happy. Eddie and Katherine are learning to not only be happy but create lives that are best for them and Theo. I really give it to Katherine for her demands to the partners and realizing that it was OK it did not work out in her favor. I personally think she was hoping they would say no to her demands. Like she said, she has her life back now. Jack: I was really proud of Katherine! She set her boundary and stuck to it. I felt like Katherine and Eddie both had dreams that have been changing because they are parents now, and Katherine realized that her dream of being a partner was outdated. I'm not so sure that Eddie made the right decision. He's going to be on the road a lot and around people who knew him when he was a drinker, and I hope that he doesn't relapse as a result. Christine: I think Katherine has been laser-focused on making partner because there was so much missing in her personal life. With her marriage falling apart, she’s looking at her life with fresh eyes and realizing what she really wants, and it isn’t to give 100% of herself to a law firm. She can still make a good living as an attorney but have a more balanced life. As for Eddie, he has let fear over falling off the wagon dictate his choices for a long time. Now that he’s forced to stand on his own, he’s understanding that he’s not only responsible for his sobriety but his own happiness as well. But like Jack said above, this is going to be a real challenge for Eddie, and I'm not entirely sure he's up for it. What are your theories about Barbara Morgan's identity, whatever Ashley is trying to do, Jon's financial troubles and in-depth planning etc.,? Rachelle: I have no idea at all. Jon was clearly in financial troubles, and Ashley knows some of it, but I think it goes much deeper than she knows. I don’t think Jon was having an affair with this Barbara Morgan, but I do think she was important to him. Maybe she is some long-lost family member who took advantage of him? I don’t know, but I hope we find out soon. Jack: I have absolutely no clue. I read a fan theory that Ashley is Jon's daughter from a previous affair. If so could Barbara Morgan be her mother? Other than that I'm lost, and I hope we find out more soon! Christine: I’m wondering if Barbara Morgan is a real person or just the name for some sort of business front. Whatever Jon was involved with, it was obviously shady, and it appears that even Ashley is somewhat in the dark. I just wish they’d give us more clues soon because I’m very curious. 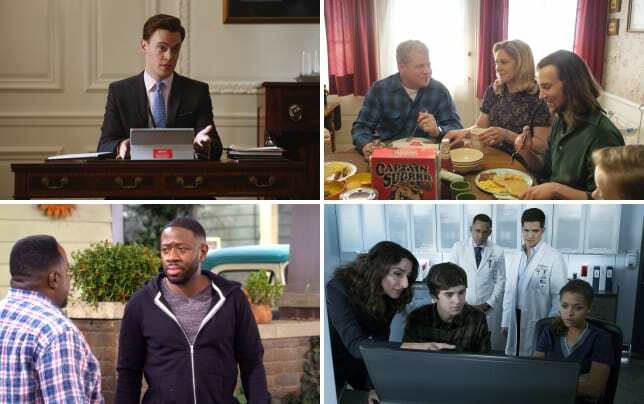 Are you content with the pacing of the show and it's storytelling? Rachelle: I am content with the pacing of the show and its storytelling other than Jon’s secret. I feel like the stories are moving along at a good pace but fans keep getting teased with the Jon story. Jack: Exactly what Rachelle said. Other than this dragged out Jon secret, I feel like we're moving at a good pace, and the stories are keeping my interest. Christine: I like that there are multiple stories going on at once, that way I never get bored. I think the show does a good job of moving them all along in a way that leaves me intrigued and mostly satisfied but still wanting more. 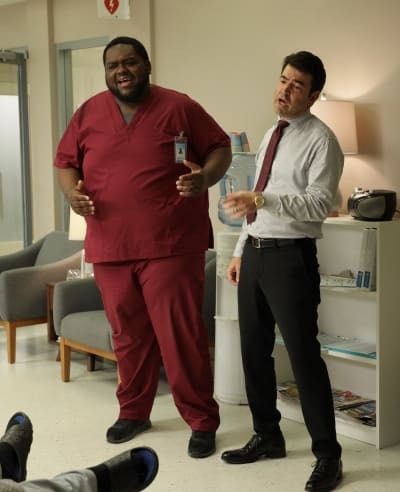 What was your favorite moment of the episode? 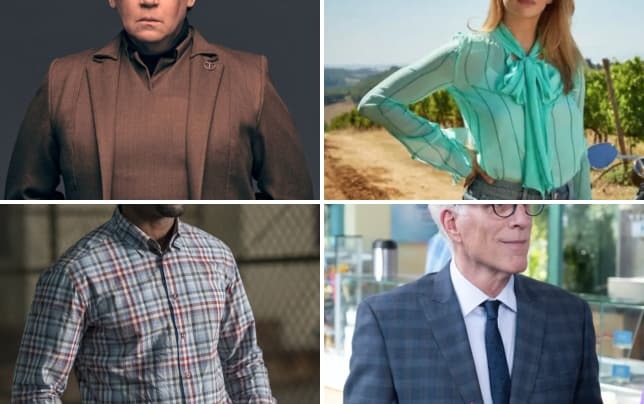 What do you hope to see in the winter finale? Rachelle: My favorite part of the episode was Gary’s flashbacks and breakdown. It was interesting to see him question whether Jon knew while Gary was fighting cancer that he was going to kill himself. It was nice to see their bond, but also see Gary’s anger unleash since he fought so hard to live but Jon didn’t. In the finale, I hope to find out what is going on with Jon’s finances. The previews make it appear like the truth is going to come out, so I hope it does. I just want to know. Jack: Gary's breakdown was definitely my favorite moment, with the reveal that Maggie went back to treatment a second favorite. I hope Maggie and Gary can work things out from here, and I really hope we find out Jon's secret in the winter finale. I'm tired of not knowing. Christine: During Gary’s breakdown, I loved that it was Eddie and Rome that went to physically comfort their friend and not the women of the group. That said a lot about their bond as friends. 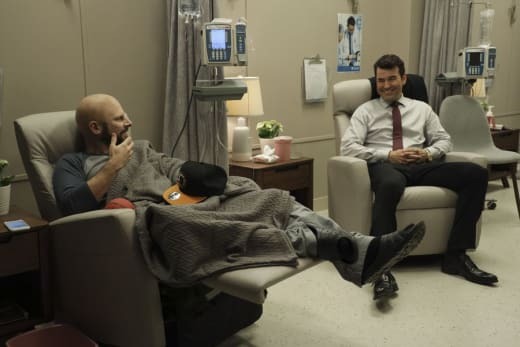 As for the winter finale, I want to see Gary learn that Maggie has started chemo before she finds out that he’s slept with Ashley. I also want to learn more about Jon’s big secret. Over to you, A Million Little Things Fanatics! Do you agree or disagree with us? Hit the comments below! You can watch A Million Little Things online here via TV Fanatic. The Winter Finale of A Million Little Things airs Wednesday on ABC. Gary: You want to know a little secret? Gary: I'm in remission one year today. Ashley: I know. Who do you think set Jon's calendar? Gary: So he would go to every session with me. Permalink: I'm in remission one year today. Look, I don't want to make a big deal out of this, but I just found out I have breast cancer. Permalink: Look, I don't want to make a big deal out of this, but I just found out I have breast cancer.